For 20 likes, I will add the Mulligan. -> Added! For 50 likes, I will give a free coaching session. The winner of the coaching session is: papadich. He will get notified now and if he doesn't answer I randomly choose someone else. For 100 likes, I will describe all the match ups in detail. -> Coming soon! Why do I request likes for content? These guides and videos take a good amount of my time. I do not get paid for this and am willing to give content out for free, but only if it gets read by many people. The only thing I kindly request for writing this is that you spread the word and make others read it. Likes help to make the deck popular and hence more people will read it. I do not want to spend hours for writing text that nobody reads or cares about. In the video series you can see how I hit legend with the deck. Make sure to subscribe or come back another day, because not all episodes are released yet. You can find the complete playlist here. Please note that the deck list developed over time. 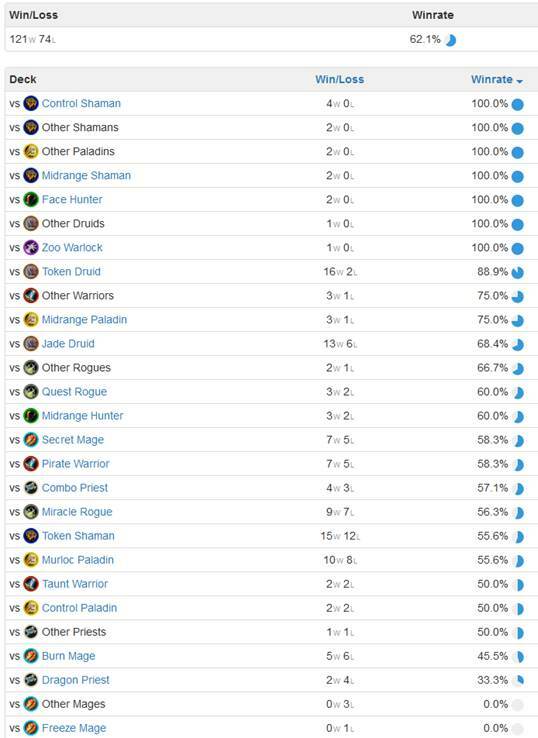 Please note that the deck list developed over time. The first games, I played a slightly different version (with Aya). This is the final list I used to for pushing to legend. Bloodsail Corsair: The early game of this deck is nuts, due the Pirates, Jade Claws, Fire Fly and Primalfin Totem. You brutally spam the board setting up for Flametongue Totem, Spirit Echo and Cult Master. The weapon destruction is even nice in the late game against Atiesh and may combo with Spirit Echo. Evolve: Combos super well with Doppelgangster, Cult Master, Thing from Below and Stonehill Defender. Remember that you can attack and even damage your minions before using this! Fire Fly: Early game and board spam. Patches the Pirate: Early game and board spam. Remember to use him withFlametongue Totem. Devolve: To counter Murlocs, Token Druid, Spikeridget Steed, Tirion Fordring, Edwin VanCleef etc. Flametongue Totem: Goes nuts with Tokens, Patches and Stonehill Defender and is a totem for Thing from Below. Jade Claws: Early game and board spam. Maelstrom Portal: Board clear that goes well with Devolve and produces another token. Remember that it can give you chargers. Primalfin Totem: Early game, board spam and a totem for Thing from Below. Mana Tide Totem: Card draw and a totem for Thing from Below. Spirit Echo: This simply generates more value than Aya Blackpaw ever can do. Spirit Echo allows you to get extra 0 Mana 5-5 Taunts, extra Stonehill Defenders, extra Tokens and sometimes even extra Doppelgangsters. If you play this card for pure value against Control, you can actually outvalue almost any deck (Don't believe me? Watch my video against Control Priest here). If you play it to get extra taunts against Aggro, you may survive just long enough while Aya doesn’t do anything. How to play Spirit Echo? Well, this depends a lot on the match up. The slower the game is, the more greedy you want to be. Against Pirate Warrior, an extra Fire Fly and Taunt Totem will be superb if there is nothing to play for 3 Mana. Against Midrange Paladin, you at least want to an extra Thing from Below and ideally an extra Stonehill Defender. Against a Control Priest you can go for pure value and copy multiple Thing from Below, Stonehill Defender and even Doopelgangster. Stonehill Defender: Together with Evolve this is your main late game value. You are usually looking for Thing from Below or depending on the match up Primordial Drake, Earth Elemental, White Eyes, or Bog Creeper. Remember that Hot Spring Guardian may give you heal. Cult Master: I am 100% convinced that 1 Cult Master is correct over 2x Mana Tide Totem. This card alone has won me multiple games. Often times it is enough to play it when you can draw one card with it. Its crazy when you hide behind taunts or draw 3 or more cards. It also goes well with Evolve. Jade Lightning: Removal and more tokens. Bloodlust: The main finisher of the deck. Doppelgangster: This you want to combo with Evolve, but in the worst case it still gives you 3 minions for Bloodlust. In value match ups this is nuts with Spirit Echo. Thing from Below: Getting this card cheap allows you to finish opponents like Jade Druid quickly and survive against aggro like Pirate Warrior. The key is to know when you can be greedy and get it even cheaper next turn and when its already strong enough to play it for 4 or 5 Mana. Always keep: Fire Fly, Primalfin Totem, Bloodsail Corsair. Keep Jade Claws unless you know its a slow match up for sure. Keep Flametongue Totem with Bloodsail Corsair against Paladin, Druid, Mage and Priest if you are going first. Keep Devolve, if you know its Murloc Paladin, Priest, Token Druid or any deck running Doomsayer. If you have Devolve, you can keep Maelstrom Portal as well against Token Druid. Never draw Patches the Pirate! Taunt Warrior: Slow and steady pressure is the key here. Your goal is to damage the opponent a little bit every turn. If you dealt 5 damage already, you dont play more minions unless you set up for lethal next turn. Overextending into a Brawl, Sleep with the Fishes or Primordial Drake can loose you the game. Make sure to push Totemic Call whenever possible and get high value out of Spirit Echo. Cult Master should at least draw 2 cards in this match up. Devolve should be used for huge taunts and sometimes Acolyte of Pain. If you can, play around Deathwing. Token Shaman: Like most aggro match ups, this one is completely about board control. The player who builds up a board for Bloodlust first, wins. If you are ahead, you dictate the trades. Make sure to not safe the coin too long. Cult Master is great, because you trade all your minions anyway. Make sure to never leave any totem up that can punish you. Don't waste Jade Lightning on Stonehill Defender, but use it for Mana Tide Totem and Flametongue Totem. Although I always keep Bloodsail Corsair, I would only play it turn 1 if I have Flametongue Totem to follow up. Silence Priest: A match is in the video above! Both Druids are in the video above! Did I miss any match up? Let me know in the comments what you are interested in! Here you find possible replacements for Legendary or Epic cards in the deck. Patches the Pirate -> Tar Creeper or Argent Squire. Spirit Echo -> Tar Creeper or Argent Squire or maybe Hex. If i dont have Patches, is it necesary to keep Bloodsaid Corsair? Or is there another replacement for this. Tom, let's say you didn't have access to Patches - how would you modify the deck such that the WR-loss is minimized (since obviously it would take a hit)? I'm not really looking for anything OP, just something with an interesting variation from my normal play styles...and this one seems to fit the bill. Thanks - didn't catch that during my initial read. May I make a suggestion - it might be preferable to precede the "match-ups" section with the "budget replacement" and possibly even the "further resources" section(s) for better visibility. And thanks for the guide. This deck is near worthless against agro. Might work at higher ranks but from 20-10 this deck isn't the deck. I had great luck till about lvl 20-19 then its all agro decks and i stand no chance. Im sure its user error, just can't see what im doing wrong? Can you do a miracle rogue matchup? they are a lot more common since the quest rogue nerf. i am really enjoying your deck so far, but almost every mage destroys me. How can i add a Eater of Secrets ? Best card to cut in favor of Eater of Secrets is Bloodlust in my opinion. In fact running 2 copies of Bloodlust might be too much anyway. If you don't have Spirit Echo, you can also replace that with Eater of Secrets. I don't think you should run 2 Eaters regardless of the situation, as it is a dead card vs most decks. Luckily Shaman runs Evolve so you can salvage dead cards like this. No Aya? But she's best girl! I don't know how to use Spirit Echo effectively can u explain more ?